Federico Giannini is a young art historian who wrote this article on his popular website Finestre sull’arte (and who kindly allowed us to translate it. If you read Italian you can find it here). The article was written while a technical team led by Maurizio Seracini was looking for the lost fresco of the Battle of Anghiari by Leonardo da Vinci in the Salone dei Cinquecento (Palazzo Vecchio, Florence) behind, literally, a fresco by Giorgio Vasari. Recently the fresco and specifically the word ‘cercatrova‘ (seek-find) is also one of the clues in the bestselling novel “Inferno” by Dan Brown so it seemed opportune to offer some ‘clarity on the word’s true meaning. 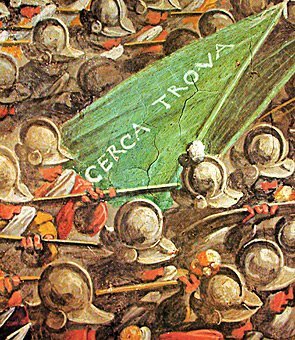 The word in question, “cercatrova“, is written on a green flag carried by the Florentine rebels who fought on the side of the Sienese against the Medici in Marciano della Chiana. To understand the meaning of “cercatrova” you need to know about the battle that was fought in Marciano della Chiana on August 2, 1554. The battle, also known as the Battle of Scannagallo from the name of the ditch near the battlefield, was fought between the Florentines, Imperial and Spanish on one side, all led by Gian Giacomo de Medici, and the Sienese, French and Swiss (and Florentine exiles)on the other. Sienese forces were commanded by Piero Strozzi, one of the Florentine rebels (and let’s not forget the Strozzi were almost always rivals of the Medici). All this took place in the context of the wars against Siena that finally surrendered to Florence in 1559, when the Republic of Siena ceased to exist and its territories became part of the Florentine republic. It was of course also the year of Cosimo I’s triumphal entrance in Siena. 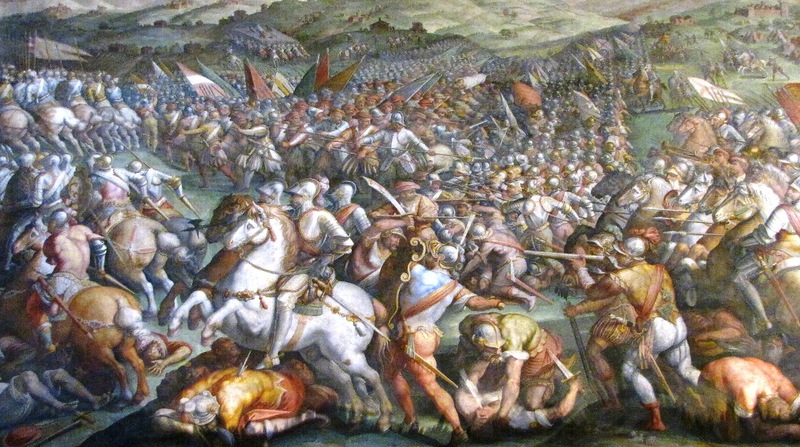 The Battle of Marciano della Chiana was won by the Florentines, and the episode marked the beginning of the end for Siena because the army under the command of Piero Strozzi suffered a serious defeat. The battle is described in detail in the Istorie Fiorentine (Florentine Histories) by Florentine historian Bernardo Segni (1504-1558) who also describes some of the banners carried by the opponents of the Florentines. This is where we begin to understand that “cercatrova” noted by Seracini refers to a completely different situation. Bernardo Segni writes regarding the Florentine exiles who fought alongside the Sienese and French: “to lift their spirits King Henry of France had donated to them twenty green flags, with Dante’s verse on them “He goes seeking liberty, which is so dear” (Libertà vo cercando, ch’è sì cara). Furthermore we know that other flags, also green, bore slogans praising the freedom of Florence (to be understood as freedom from the Medici): for example the word Libertas or initials SPQF (Senatus Popolusque Florentinus, meaning “the Senate and People of Florence”). But why has Vasari decided to write “Cercatrova” and not the entire verse of Dante that according to Segni decorated the flags of the rebels? To answer this question, we find enlightment from an art historian who noticed the inscription “cercatrova” well before Seracini. We do not know if Maurizio Seracini was believed to behave been the first to have noticed it, but we have to inform you that he arrives at best second. In 1969, in fact, the art historian Lionello Giorgio Boccia published an essay in which he refers not only to Vasari ‘s fresco depicting the Battle of Marciano della Chiana but also to the flags carried by the opposing sides, including of course the green one with the words “cercatrova“. Boccia wrote: “Most flags are green and they really were, as we have seen, those of the exiled anti-Medicean Florentines. These green flags also appear in the great fresco by Vasari, but instead of the motto LIBERTAS or SPQF, one of them (the penultimate to the far left wing of the Strozzi) bears the inscription ‘he who seeks finds’, alluding, with heavy irony, to the false quest for freedom of the exiled, who became instruments under foreign control and now were to be dealt a heavy punishment “. So the phrase that many would interpret as conclusive evidence that Vasari concealed Leonardo’s fresco of the Battle of Anghiari on purpose turns out to be a sarcastic motto, ridiculing the group of exiled rebels (obviously considered traitors of Florence) that, fighting alongside Siena, were looking for a way to free Florence from the Medici. Instead of freedom they found harsh punishment: as a result of the battle many rebels were taken prisoner, brought to Florence and then executed.